One of the lovely things about putting transfers on ceramics is that everything gets sent away for a day or two to be fired. By the time it comes back I've almost forgotten what I've done, and unpacking the boxes feels a bit like unwrapping presents. More photos of the new batch on my Flickr page. Very pretty. I like this style mug, too. 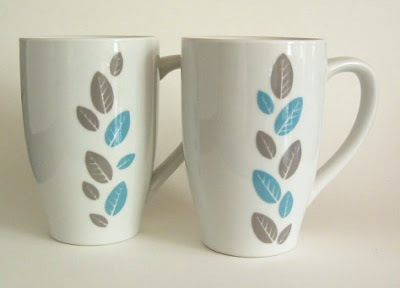 The leaves of the decals look great with the elongated shape of the mug. Great job! I checked your flickr and love love love all your new wares. Great job! Oh my, they look great I went to your flickr site and I just love the tiny bowl of tears. I love the coffe mugs! My son gave me a singing mug for my birthday and although it was fun in the beginning, is now totally irritating. Maybe I shoud trade it in for one of your stylish mugs! i love the new mugs! i like creating late into the night, and then getting up the next morning to review the previous night's work -- it's almost like christmas! These are beautiful! I love all of your ceramic pieces.